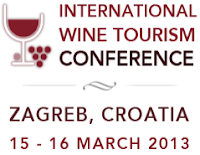 15.03.2013 (Hvino News) Georgia participates in 5th International Wine Tourism Conference (IWINETC) in Zagreb, Croatia, on 15 - 16 March. Georgia is also one of main sponsors of the Conference (read more: Georgia to sponsor wine tourism conference in Zagreb). On Saturday March 16th IWINETC closes with a tasting of Georgian wines. “Bolomde!” – bottoms up! Chateau Mukhrani also offers Goruli Mtsvane, Georgia’s local white varietal whose green tinge signifies acidic structure and potential for aging. Winiveria Winery is bringing a wine made from Khikhvi, a white grape with an identifiable unique fragrance of exotic fruits and a selection featuring Rkatsiteli grapes.